Some time in the early-mid 1930s, my father’s family went on a trip to California. While they were there, they went on a tour of the MGM Studios, and while on that tour had a chance to get autographs from a number of MGM stars. My aunt and godmother Kathleen Duntemann was perhaps 13 or 14 at that time, and we have a photo of her with her arm around Mickey Rooney, who (I see, thanks to Wikipedia) was three weeks younger than she. The autograph itself did not surface when Gretchen and I were sorting Aunt Kathleen’s effects after her death, more’s the pity, but the shot you see here has always taken the cake as the oddest family photo in the three boxes full that have survived. And while we’re talking family photos, I have some advice: Write the names of the people shown in the photos on the backs while you’re still alive and remember who’s who, what was going on, and when. You won’t be the last person to look at those photos, especially if you have children or grandchildren. I have huge numbers of very old photos of people lined up somewhere, and have no clue who they are nor where they were taken. I have a photo of my father in uniform with his arm around a girl in August 1942, which would be just before he left for Italy. No idea who the girl is. My father took photos of steam locomotives, and never failed to carefully write on the back what model, and what railroad. Girls? How could a girl stack up to a C&NW 4-6-0? I’m doing a project for our church that involves scanning a lot of old photos, and while I’m at it, I’m scanning things that have been waiting in a ratty file pocket for scanning since, well, (in some cases) almost forever. Most are unremarkable, though a few of them are remarkable to Carol and me, like the first photo I ever took of her (at right) and the sheet of paper on which she wrote her phone number on the night we met. A few other things in the folder are odd indeed, though how odd depends on how strongly your taste buds respond to “odd.” So I’m going to present a couple of those odd things here and in coming days, just for fun. Years ago, I bought a box of old books at an estate sale. They were interesting to flip through, but most of them were pretty moldy, and smelled, so did not stay in my possession very long. However, in one of them was an apparently uncirculated 1928 $1 US silver certificate, tossed in perhaps to flatten it. (I doubt that a dollar bill would be used as a bookmark in 1928…) Though like most boomer kids I collected pennies in the 60s, when I had currency (which I didn’t often) I spent it. I had never seen a bill that old, and although the obverse would be instantly recognizable, the reverse looks like no dollar bill I’ve ever seen. In preparing this post, I ran into an interesting conundrum: The US Treasury regulations on reproducing pictures of currency specify that color photos must be either 75% or less of actual size, or 150% or more of actual size. Fair enough–but how does that translate to an image on the Web? The image above is about 75% of natural size on my hires monitor, but how about on your netbook? I sniffed around online and found no guidance, but surely, this issue must have come up since the Web went mainstream 15 years ago. Perhaps most interesting of all is the fact that the bill did not smell like the book it had been pressed in for what may have been 65 years–and that book you could smell six feet away. How do they do that? Tomorrow: Jeff’s dad meets Frankenstein. Really. I was in here working earlier this morning when I heard some minor disturbance behind me, after which a white blur hurtled toward the door. Sensing something interesting going on, I grabbed my pocket camera and followed Dash to his little tiger-striped dog bed, where he sat with four or five of my old business cards hanging from his mouth in only slightly chewed condition, paw extended as though to shake on a deal: Don’t hit me, and you can have your cards back. I didn’t hit him. And I allowed him to keep the cards for a minute or two, since they were in fact obsolete and headed for the recycle bin anyway. (I need new business cards, but not as badly as I need the time to create them.) It wasn’t until he began to shred them and swallow the pieces that I took what was left of the cards away from him. Ten minutes later, he ambled back into my office and went directly to the bottom shelf where the box of cards lay. Looking over my shoulder, I watched him carefully withdraw another five or six cards from the nearly full box and edge toward the door again. Gotcha! This time I actually dumped the box into the recycle bin. A fortune in dog toys, and he wants to chew pasteboard. Or maybe it was a noodge to clean up my office. With dogs, it’s hard to tell. My mother had a drawer full of them in the 60s and 70s: These little things like shower caps, circles of plastic sheet of a sort you’d recognize from shower curtains, with an elastic gather around the edge. I actually called them “shower caps” in my head, and we used them to close half-used cans of mandarin orange segments and mushrooms. I didn’t think much about them until a year or two ago, when yogurt containers stopped coming with closable lids. I don’t toss back a whole 6 oz container of yogurt every morning, so this was a major irritation. In our climate, things dry out fast in the fridge, so putting something over an opened yogurt container is essential. For awhile there were shower caps, QuickCovers from Saran, but only the tiniest ones were applicable to yogurt, and even those were a little on the big side. We haven’t seen QuickCovers in stores in some time, and have been reduced to fighting with the plastic wrap to close a yogurt container for tomorrow. That’s an irritation to reckon with. I always say: If you’re going to allow yourself to be irritated, be irritated at something trivial. Irritation then won’t ruin your game. It’s an obviously useful thing. Why aren’t they made anymore? Does everybody really eat six whole ounces of yogurt every time they have any at all? Am I really reaching this hard for Contra entries? No. I’m serious. If you know where such things live, or even what they’re called, let me know. I’m tired of wrestling with the Saran wrap. Out, Damned Spots! Out, I Say! Just my luck: I get a decent dipole strung in the attic, and the sun gets even quieter than it was earlier this summer, when a flurry of tiny sunspots (and one lonely one I might promote from “tiny” to “small”) led everyone to shout that the solar minimum was over. Not so. 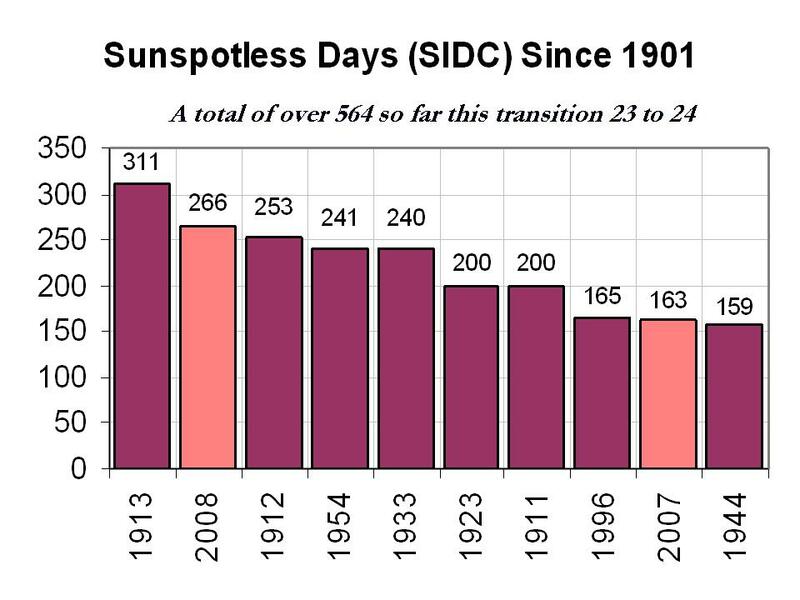 A few weeks ago, 2009 pushed into the top ten years of sunspot-less days since 1900. Spaceweather tells me that we’ve now seen 182 spotless days this year so far, pushing past 1996 into position #8 on the No-Spot Parade. (See the graph covering complete years here.) At 40 in a row, we’re in very rarefied statistical territory, even at solar minima. And if we make it to the end of August without any spots, we could see a full spotless calendar month, which is even rarer. The next milestone comes after 18 more spotless days, when 2009 hits 200 and pushes past tied years 1911 and 1923 into spot (as it were) #6. We need 59 more spotless days this year to surpass 1954 and reach #4. We may just possibly do that, but I’m predicting that that’s as far as 2009 will get, since there are, after all, only 133 days left this year. But yikes! This is shaping up to be a minimum like nothing seen since 1911-1913. It’s been a cool, wet summer in Colorado Springs and, in fact, a cool, wet summer in a lot of places north of poor Texas. Maybe it’s a coincidence and maybe it isn’t. A quiet Sun is a cooler Sun, and we know far, far less about its effect on climate than we’re willing to admit. In the meantime, well, sure, I’d like to work Tuvalu on three watts into a hairpin too–but 70 degree summer days and full reservoirs are not shabby compensation. Old Catholic geek bishop Sam’l Bassett sent me word of Micro-Rax, a 10mm version of the well-known 25mm or 40mm 80/20 system for industrial prototyping. I’ve held off fooling with T-slot projects because the stock was out of scale for what I was trying to do, but this could be just the thing. The company (owned and run by a pair of identical twins) is just getting underway with Micro-RAX, and it’s worth watching. I’m may buy a set just for the helluvit. And speaking of nuclear, I spaced on this back in late June because my site got hacked, but Pete Albrecht pointed out a whole site devoted to nuclear yield and exposure slide rules. From the Words I Didn’t Know Until Yesterday Department: Shoegazing is a musical subsubsubgenre that existed for a few years in the early 1990s, and sounds like, well, nondescript rock music. (Thanks to Pete Albrecht for pointing it out.) The name comes from a tendency of some shoegazer bands to stare at the stage while they played. Apparently the movement died when it became “…over-privileged, self-indulgent and middle-class.” Damn. The nerve. GM is now selling cars on eBay. It sounds ridiculous at first blush, but what piques my interest is the de-emphasis on face-to-face dickering, which I absolutely cannot stand. When Carol and I bought our 4Runner in April 2001, the sales experience was so hideously unpleasant that every time we think about buying a new car these days, we shiver and stick with what we have. Spaceweather has a wonderful animated gif of Jupiter’s moon Io crossing its disk at opposition, meaning that Io’s shadow is immediately below it on Jupiter’s disk and gives a 3-D effect to the photo that you generally don’t see. And if that weren’t enough, the same site has an animated gif of Io’s shadow passing over Ganymede! Here’s a Web site I could have used back when the Lord of the Rings film trilogy was in the theaters: RunPee.com, which makes suggestions as to when you might miss less of the film by taking a bathroom break. Very important for certain old guys with certain oversized glands. How did Benjamin Frankin manage his time on a typical day? Here’s a page out of his daily scheduler, though Outlook was still a couple of centuries in the future. Ben’s day is amazingly like my day, save that I generally stay in bed a little longer. But I too hit the sack at 10 PM or before–been doing that for five decades and then some. Thanks to David Stafford for the link. And in in reading about Ben’s day I found this article by Paul Graham, about the differences between managers’ schedules and what Paul calls “makers’ schedules.” Definitely worth reading. The two cultures need to understand one another, and generally don’t, with much anguish and lost productivity resulting. For twelve years now I’ve been intrigued by the fact that every time I cut “habitual carbs” from my diet (and by that I mean carbs I eat every day, and not a couple of cookies or an ice cream cone now and then) I lose weight. I was even more intrigued when I spent a few weeks eating almost no carbs at all (basically, lots of protein and animal fat) and lost even more weight. I’ll have my latest bloodwork results back in a week or so, and (as requested) I’ll summarize the numbers here. I’ve read several books on the topic, as well as a pamphlet on obesity dating back to the Civil War. And having read the history of the carb wars in some detail, I see it as a classic “bad science” issue: Egos, agendas, lobbyists, grant money and slimy politics distorted the public message on diet and health, and even though the original science has long been discredited, too many people would lose too much face if the health establishment abruptly reversed itself…so the low-fat nonsense persists. It’s a rich field of study, and if my last six months hadn’t been swallowed by rewriting a 600-page programming book, I would have begun reviewing the material here already. So let’s get started. Naughton has done stand-up comedy, and it shows. He’s a disarming and engaging interviewer, buttonholing people outside of McDonald’s to see whether those people think fast food is high-calorie or unhealthy, or whether they feel addicted to it. At one point, he buttonholes a young woman with an accent. “Where are you from?” he asks. “Russia,” she replies. “Oh–can you say ‘Moose and Squirrel? '” She looks at him funny, but then she does say it, and it’s perfect. As if that were not enough, after the McDonald’s month he spent another month doing what I did this past January: Eating almost no carbs at all, but feasting on bacon, eggs, marbled steaks, cheese fried in butter, and other yummy things that most people today find as frightening as the mythical Com’nists were in the 50s. When it was over, he had his blood numbers run again, and they improved. Probably the best part of the DVD is the summary of the health science behind his conclusions, done in simple animated diagrams. It’s not tremendously detailed and there are no citations to follow, but by watching it, you get your bearings. And that’s really what Fat Head is: orientation, and a starting point for further research. It doesn’t stand alone. After seeing Fat Head, you have to hit the library or the bookstore and pick up a few books, particularly Good Calories, Bad Calories by Gary Taubes, Fat Politics by Eric Oliver, and Protein Power, by the Drs. Eades. I would add Calories Don’t Count by Herman Taller (1962) and Banting’s Letter on Corpulence (1865). 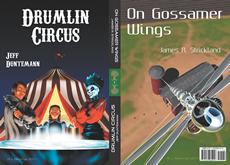 (I’m still working through Barry Groves’ Trick and Treat and have a few others on the shelf.) People cite much-ridiculed Dr. Atkins as well, but there’s nothing in the Atkins books that isn’t mentioned in many other places, and his conclusions have been vindicated in research that he had nothing to do with. Finally, the closing credits roll over a wonderful original funny song (I guess you could call it a filk) called “The Experts,” which in some respects is worth the price of admission. I don’t see the lyrics on Tom Naughton’s Web site, but damn, don’t miss it! A certain four-legged somebody ambled into my office a little while ago and presented me with one of my bedroom slippers. Every man’s dream, right? A dog who brings his slippers and his evening paper? Except that it was 10:30 AM and I’d been up and dressed for four hours…and the slipper had teeth marks in it. I grabbed for the slipper…and he expertly dodged and headed back for the door at flank speed, glancing over his shoulder to make sure I was in pursuit. Let’s just say we don’t let him anywhere near the newspaper. Heh. Meet Dash. I tagged him Redball at first (see my entry for July 12, 2009) because he was the “red” puppy out of that litter (puppies in a litter are often color coded with collar ribbons or a daub of nail polish on their ears) and because he liked to chew on the red ball on the mini-bungee holding his Lixit bottle in place. But puppies eventually tell you their true names, and with Dash it became clear from his head-down, pedal-to-the-metal running style that he had lots in common with young Dashiell “Dash” Parr, particularly when his pack was in play mode or when the pack was not, but he wanted to be. Like this morning, with my slipper. For now, indeed, we have a pack. As most of you know, we fostered a mamma dog and her litter of three puppies when their owner was hospitalized, and we decided to keep one of the puppies. We also have Jack, AKA Jackpot and Jackie Gleason, a very large three-year-old male bichon whom I myself have handled in the show ring. Dash makes four, and it’s been interesting to observe pack dynamics and the ongoing discussion over pack hierarchy. QBit is the sometimes challenged but still unvanquished boss. Although clipped, he’s the oldest and the most muscular, and his muscle evidently generates enough testosterone to keep the other guys in their places. QBit can flip and pin 10-pound Aero without half trying, and although Jack is larger and a little heavier than QBit, he’s far less muscular and just naturally submissive. The dynamic most in play is the one between Aero and Jack: Aero would like to be the boss but won’t be any time soon, and Jack seems to understand that even though he’s lost some weight he still has ten pounds on Aero and doesn’t seem interested in playing the dominance game. And Dash, well, he still has full puppy privileges. He can crawl on top of QBit and lie down, or take bones away from both Aero and Jack if their bones are the ones he wants. In fact, Dash treats both Aero and Jack as babysitters and sometimes as just another pair of stuffed toys; he’ll grab one of Jack’s ears and pull as hard as he can while Jack stolidly stands there, waiting patiently for the young brat to get bored. Aero and Dash play a sort of gymnastic “flip” game that consists of Aero flipping Dash over while Dash swats back at Aero with his front paws. We’re guessing that Aero is trying to get a jump on the pack hierarchy question while the brat is still small enough to flip, but we’re also guessing that a mature Dash will outweigh Aero by at least five pounds, and an unclipped Dash may not just roll over for Aero out of simple seniority. Dash’s pigment is improving as time passes (he’s now 13 weeks old) and Carol thinks he’s definitely show-quality, if not as generally perfect as Aero. One oddness is that his eyes reflect a luminous blue in a camera flash, which I’ve never seen in a bichon before. (Aero’s eyes reflect gold, and QBit’s green.) Most significantly, Dash is taking to the litterbox quite well, and although he still has accidents, he’s better on potty discipline at 13 weeks than either Aero or Jack are as adults. He’s noisy, confident, and extremely playful, and having a puppy in the house from six and a half weeks is an experience we’ve never had before and may never have again, so we’re paying attention, taking pictures, and enjoying it as much as we can. Sleep seems to be key in allowing the brain to infer big-picture relationships from scattered facts–and by implication, memories. I’ve never been a strong sleeper, and I wonder if some of the “fails” in my older memories stem from inadequate deep sleep. Also from Wired Science: People who don’t get enough sleep are touchy and angry. (Not like that’s news to anyone who’s prone to sleepless nights.) Could this explain the peculiar unpleasantness of the political blogosphere? I’ll vouch for the fact that peace, love, and tolerance of people who disagree with you is much easier on nine hours’ sleep than five. If you’ll forgive the expression, here’s a long, beefy article on why everybody thinks animal fat is a bad thing (hint: it’s because a Right Man cherry-picked his data to confirm his hypothesis) and why, to the contrary, animal fat may be very, very good for us. I was wrong about it coming from a Kum & Go store; while sorting my charge card receipts I discovered that Fat Dogs (see my entry for August 7, 2009) is a small chain of Conoco-franchised gas station/convenience stores limited to Western Nebraska. They had some water private-labeled by Sandhills Water, and put their wry corporate motto on the top of the label. Lileks takes on the Sears Catalog for 1973. I remember that catalog. Fortunately, my clothes came from Goldblatts. And did real, human, breathing girls wear these things? Maybe the girls in Hoffman Estates did. In my neighborhood, well…no. From the Words I Didn’t Know Until Yesterday Department: juiceboxer, a young, arrogant, high-status preppie-type. Their parents got their juice from bottles. And their grandparents mostly got it while it was still inside the fruit. Juice as a product is a relatively new thing; keeping juice from fermenting is difficult and one of the unappreciated miracles of our modern age.